So for the past two weeks I've featured a 5 minute card on my blog. I've decided to change the name of the feature to Quick Card because some cards do take just a little bit longer. This one took me a little under 10 minutes from start to finish. It's a simple design and that's how it came to be. 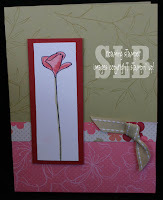 I was wanting to do a quick card that featured some stamping other than a verse. I was looking through some sketches and this one caught my eye. I decided to put it to the test. All products available from Stampin' Up! The image was stamped in black and I used a blender pen to color in the flower.